The clocks have turned back and the leaves are turning color as we turn the calendar to the month of November. Though colder weather is ahead, our hearts grow warm thinking about the approaching holiday season, starting with Thanksgiving. Thanksgiving is a time to loosen the belt and strengthen bonds with friends and family members. However, this year, 24 Rhode Islanders won’t be at the Thanksgiving table due to fatalities caused by drunk drivers, accounting for 36.9% of all motor vehicle related deaths in 2014. Don’t let your friends and family members become a statistic or threaten the health of other drivers on the road. There are things you can do to keep your friends, family, and loved ones safe and healthy. Learn about blood-alcohol levels and individual limits. Designate a safe driver or seek alternatives to arrive home safely. Use our holiday safe ride on Thanksgiving eve to get home safely. A 2012 survey found that 2.4% of Rhode Island drivers admitted to getting behind the wheel after drinking too much. 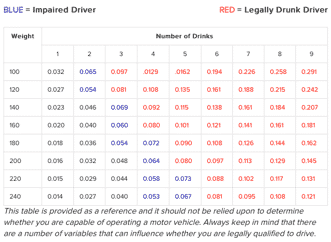 Rhode Island state law prohibits any driver from driving with a blood-alcohol level .08% or above. However, knowing a number doesn’t always help people understand how many drinks .08% really represents. Use the following chart to realize limits and when to stop drinking. Be aware that the kind of drink matters regarding the percentage of contained alcohol. The average 12-ounce beer hosts 5% alcohol; one glass of wine has 15% alcohol; and, a 1.5 fluid ounce shot of 80-proof liquor contains 40% alcohol. Though a shot is less liquid it is still the same serving of alcohol, it is important to know this! Before the festivities begin, assign a trusted friend or family member to be the designated driver, or take the initiative in ensuring the people in your immediate party are safe by electing yourself. Don’t spoil the holiday season and the New Year by putting yourself or others at risk on the road. Be proactive and have a safe option in place before the fun begins. 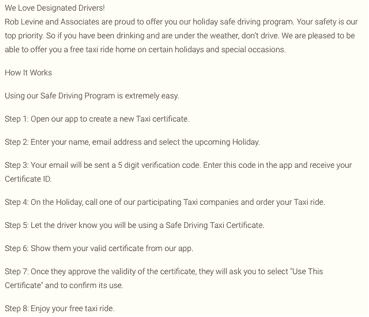 If you have trouble electing a responsible party, or if no one volunteers, there is an easy solution: The Rob Levine Holiday Safe Ride app. Enjoy a free and safe ride home. In 2012, more than 10,000 people died in alcohol-impaired crashes. This means one person died every 51 minutes because of a drunk driver. Such crashes cost more than $37 billion per year. In 2014, 2,713 Rhode Islanders were arrested for driving under the influence. It’s hard to estimate how many people are injured by DUI offenders since not all victims seek the proper medical and legal assistance. Victims of drunk driving accidents can suffer horribly: the medical bills can start to pile up, lost wages from missing work, decreased earning capacity due to disabilities, cosmetic defamation, as well as physical and emotional pain and suffering. Some accidents result in minor injuries while others have devastating outcomes. If you have suffered injuries from a drunk driver or any other person’s negligence from a car wreck, ensure you’re compensated for your pain, suffering, and loss by contacting an experienced and knowledgeable car accident lawyer.